The Microlight ML830® is a handheld, battery-operated, noninvasive, light-emitting, medical device. Approved by the FDA for use in the treatment of a variety of soft and connective tissue disorders as well as certain neurological disorders, this device is a low energy laser also known as a "cold laser". 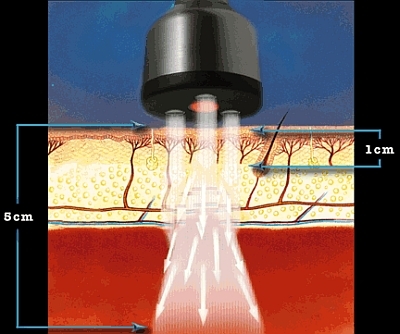 In contrast to general surgical or cosmetic lasers that produce heat and thermo-destructive laser energy, Cold Laser produces no harm to human tissue. These types of medical lasers have been in use for over 30 years and have a long record of successful and clinical safety. The light emitted with biological receptors (chromophores) in the body. this has demonstrated the ability to significantly accelerate and enhance the body's natural repair system in the presence of injury and inflammation. By effecting and limiting inflammation and enhancing specific repair and healing processes, injury damage, pain and loss of function is reduced. Studies show faster repair and recovery time and stronger healed tissue structures. Arthritis, Back/Neck Pain, Bursitis, Carpal Tunnel Syndrome, Fibromyalgia, Plantar Fasciitis. Herniated & Bulging Discs, Knee Pain, Muscle Pain, Nerve Pain, Shoulder Pain, Tendonitis & more!